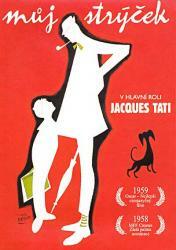 Comedy, Italy/France, 1958, 110 min. Synopsis A Frenchman tries to stave off the modernization and the new-fangled technological gadgets of society and grows at odds with his brother-in-law whose suburban house is filled with every concievable new appliance. Soon, the former realizes he can't stay living the old-fashioned way forever and his first dabblings with the machines are clumsy ones.